In today’s crowded market, your creative thinking skills are vital to your business’ growth and success. Creativity leads to innovation. It has the power to produce better products, killer marketing campaigns, and new processes that can cut costs and improve quality. There are tons of effective techniques that can help you flex your creative muscles. You can attend workshops, read books, and even listen to success stories. But there is a simple yet powerful way to sharpen your creative thinking skills. And this is through giving your brain some idle time. In this week’s edition of Five Tips Tuesday, we’ll discuss the perks of spacing out and how you can use it in your entrepreneurial journey. Discover how idle moments affect your mind. Learn how daydreaming can help you become more productive. Check out the creativity exercises you can try during breaks. Listen to inspiring podcasts that will spark your creative genius. And of course, grab the book that will show you the power of boredom. Technology improved our lives, but it also made us a lot busier. It gave us little time to let our minds wander, because we often use the internet or smartphones during our spare moments. But according to a recent research, letting yourself space out can lead to better creative thinking skills. 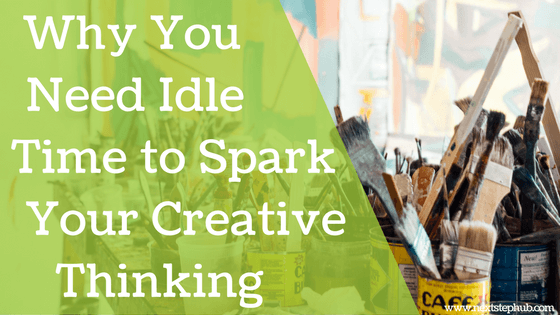 Read this article and find out why idle moments are crucial for creativity. Some people think that daydreaming hurts their productivity. But it’s scientifically proven that mind wandering can give your brain an extra boost. However, there is a proper way of daydreaming. This is known as “positive constructive daydreaming”. When practiced right, this can even strengthen your leadership ability and re-energize your brain. Staying focused for too long can cause creative block and hinder performance. That’s why it’s important to have some brief mental breaks. Short breaks can improve your focus and idea generation approach. Check out these creativity exercises that your team can try during brain breaks. Listening to podcasts during your idle time will bring you awesome benefits. Engaging stories and content can entertain, inspire, and educate you. Here are the 10 excellent podcasts that can surely crank up your creative thinking. For Manoush Zomorodi, host of popular radio show “Note to Self”, it’s time to prioritize “doing nothing” on your to-do list. In her book “Bored and Brilliant”, Manoush explains the strong connection between boredom and original thinking. She also shows how you can harness boredom to unleash your most productive and creative self. In addition, this book is also packed with practical exercises to people who want to reclaim the power of spacing out. Do you have other tips that can help entrepreneurs improve their creative thinking skills? Tell us in the comments!